Gloria Cain says her husband, Herman, isn’t capable of sexual harassment. How does she know for sure? In an interview with Fox News’ Greta Van Susteren on Monday Gloria Cain essentially says the same thing but elaborates further, saying she knows him better than anyone and is certain he’s not capable of the boorish behavior he’s accused of having exhibited. I’m not sure if this is the newest excuse to be added to the annals of defenses offered by political wives whose husbands have been accused of sexual misbehavior, or just one I’ve not heard before. Either way it makes me wonder why these women think that simply talking about their own knowledge about, and trust in, their husbands is enough to help their men regain the public’s trust. I understand it was once a surefire political strategy for damage control: Sincere, loving wife comes out and says husband is a good man who would never disrespect her or any other woman. Public believes her, gives husband a pass, and votes him into office. Sexual harassment is not the same thing as fathering a child with a mistress while running for president, or having an affair with an intern in the White House, but, like those acts, the harassment does involve behavior of a sexual nature – albeit nonconsensual – with women who are not the politicians’ wives. Wives who nonetheless defend them. While Herman Cain has vigorously denied the allegations against him and we can’t be certain of who’s telling the truth, one thing is certain – usually where there’s smoke, there’s fire. Herman Cain has been accused by four women and, his angry denials notwithstanding, there’s a growing conflagration around him. If his lawyer’s recent threats don’t scare off his accusers, or any others who may not yet have come forward, we may get more details about the allegations and Cain may find himself suffering from smoke inhalation. 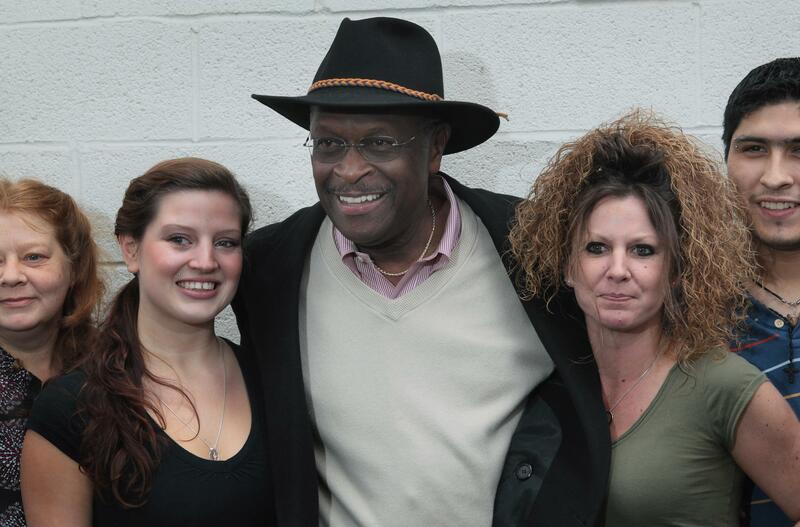 Gloria Cain may know a very different Herman Cain than the one his accusers know. Most husbands who sexually harass women don’t do it when their wives are around, so it’s understandable that Gloria Cain would have trouble believing the accusations. Herman Cain’s problem is not whether his wife believes the allegations; it’s whether the public does. With accusers seemingly coming out of the woodwork, sooner or later his protestations of being persecuted by lying women will ring hollow.